Jordan issues official condemnation against mass Jewish visit to Jerusalem holy site. The Jordanian government lodged an official protest with Israel Sunday, after more than 1,000 Jews visited the Temple Mount in Jerusalem. On Sunday, as many as 1,400 Jews ascended the holy site to mark the Ninth of Av, the anniversary of the destruction of the two Jewish temples which were located on the Temple Mount. Ten people were arrested on the Temple Mount Sunday, including nine Jewish visitors who were removed from the site for bowing on the Mount. One Arab youth was arrested after he confronted Jewish visitors, shouting slogans and waving a Palestinian flag. Non-Muslims are prohibited from praying or making religious gestures on the Temple Mount, which is administered by the Waqf – a Jordanian-based Islamic trust. Later on Sunday, the Jordanian government condemned the mass visit by Jews to the holy site, and sent a letter of protest to the Israeli government. In the letter, the Jordanian government claimed that the “provocative” visit constituted an “attack on the al-Aqsa Mosque”. Palestinian Authority officials also condemned the mass Jewish visit to the Temple Mount. Last week, Prime Minister Binyamin Netanyahu prevented Agricultural Minister Uri Ariel (Jewish Home) from ascending the Temple Mount on Tisha B’Av. Arutz Sheva was informed that Ariel's request was rejected following a request by the Jordanian government, which claimed that in his recent ascension to the Temple Mount, Minister Ariel linked the importance of going up to the Temple Mount with the weekly Torah portion "Pinchas." In light of the Jordanian request, Netanyahu decided to forbid Minister Ariel to visit the Temple Mount on Tisha B'Av. On the other hand, a security official asserted that Minister Ariel knew in advance that he would not be allowed to ascend the Temple Mount on Tisha B’Av. 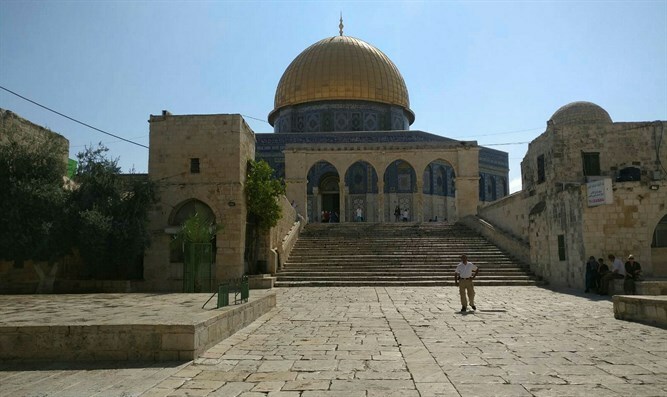 "When the ban on Knesset members from ascending the Temple Mount was lifted, the defense establishment set rules according to which every MK could go up to the Temple Mount once every three months. Minister Ariel rushed to be the first one to ascend, knowing that the next time he could go up would be only months later,” said the official. The security official hinted that Ariel had acted in bad faith when he knew he would not be permitted to go up to the Temple Mount, and yet made sure to make his request public in order to "make a political gain."